Recommended prescription range for Trivex Lenses: Sphere power below + or - 3.00; Cylinder power below + or - 2.00 Trivex lenses are the new rival for polycarbonate lense; they are thin, lightweight and much more impact-resistant than regular Plastic CR-39 or Polycarbonate lenses. 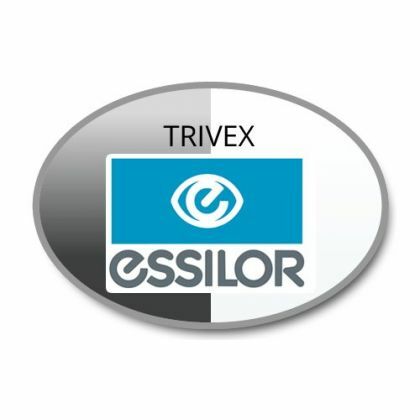 Trivex lenses have crisper optics, and may have sharper central vision than Polycarbonate lenses. They may also have less chromatic aberration then Polycarbonate lenses as well as sharper peripheral vision. The index of refraction is 1.53, making them about 10% thicker than Polycarbonate lenses. Trivex lenses offer 100% protection from UV light, as do Polycarbonate lenses, however, they do need a scratch-resistant coating to prevent scratches. Todays modern coatings can make the surface of these lenses nearly as hard as glass.